A new study by doctors in Boston Children's Hospital show that increased consumption of peanuts by pregnant mothers lower risk of peanut allergy in their babies. The study is based on mothers who are not allergic to peanuts. Peanut allergies are a type of allergy where a person gets an allergic reaction from consuming peanuts and its derivatives. Peanut allergies are common in children. The reactions range from minor skin irritations to anaphylaxis (a life threatening reaction). 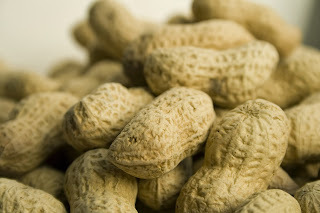 For some people who has this allergy, even a tiny amount of peanut can cause a serious reaction. Peanut allergies and other type of food allergies are caused when the proteins from the food is mistakenly considered a threat to the body by the immune system. The immune system releases chemicals to combat the presumed threat and causes the allergic reaction. The latest study is still in its early stages to strongly prove that peanut consumption will lower peanut allergies. But what it does show is that eating peanuts even when pregnant does not cause the allergy to manifest in the mother's offspring. To further define the relationship between maternal diet and the development of food allergy in offspring, Young and his team analyzed large amounts of data provided by the Growing Up Today Study (GUTS). Examining the records of 8,205 children, the researchers positively identified 140 cases of peanut or tree nut allergies. They then examined the diets of each child's mother—specifically, peanut and nut consumption—during the peri-pregnancy period and compared them with the dietary habits of pregnant women whose children did not develop a peanut allergy.